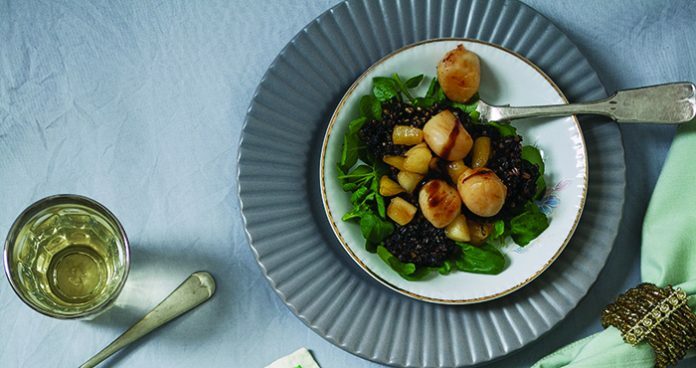 Ireland is famous for its seafood, and for good reason — so why not make the most of our cuisine with this delicious dish combining plump scallops with earthy Clonakilty Blackpudding and the sweetness of apple? This gorgeous meal is surprisingly quick and easy to make, and will wow your guests. Heat the butter in a large pot over a medium-low heat. Add the apples and sprinkle over the sugar. Cook, stirring frequently, for 8-10 minutes until softened and caramelised. Remove from the heat and set aside. Heat half of the oil in a frying pan over a high heat. Cook the Blackpudding for 3-4 minutes per side until cooked through and crispy. Transfer to a plate and set aside. Prepare four serving plates. Place a handful of watercress in the centre of each plate and add three pieces of pudding. Top each piece of pudding with some of the caramelised apples. Heat the remaining oil in the frying pan over a high heat until extremely hot. Pat the scallops dry with kitchen paper and season both sides with salt and black pepper. Add the scallops to the pan and cook without moving them at all for two minutes. Flip them over and cook for another 30 seconds, then remove from the heat. Place a scallop on top of each stack of pudding and apple. Drizzle everything with a little balsamic syrup and serve. Recipe courtesy of Clonakilty Blackpudding. Hungry for more? Why not try the sticky pigs in blankets or the roast pork with thyme and onion stuffing made with Clonakilty sausages.